Patients needing an ambulance from a GP surgery are waiting three times as long as other members of the public, an investigation has found. Family doctors say 999 calls are being ‘deliberately downgraded’ by operators if there is already a medical professional on the scene. One patient with sepsis was made to wait three hours after their GP called for an ambulance from the surgery. Another doctor said they waited ‘several hours’ with a baby with a critical heart condition who only just survived. A Freedom of Information investigation has revealed how average response times are significantly longer for calls made from a GP practice, across all ambulance trusts in the UK. The findings by Pulse magazine will raise concerns that the ambulance service is deploying a two-tier system to try and cope with the rising volume of calls. In the East Midlands, the average response time for GP calls last year was two hours 38 minutes, three times longer than the 48 minutes recorded for other members of the public. The South Central Ambulance Service said the average response time was one hour and 14 minutes for patients with a GP and just 32 minutes for everyone else. Calls to the ambulance service have increased by a third in a decade due to the rising and aging population and the difficulties faced by patients getting hold of a GP. Figures obtained by the Mail last week showed that 157,000 patients waited at least an hour for an ambulance last year including heart attack and stroke victims. Some doctors advise patients to avoid telling 999 operators if they are with a GP to ensure they get a faster response. ‘If I am with a patient who needs an urgent ambulance I have been known to say to the family ‘you dial 999 and deny that I am here’. Dr Richard Vautrey, chair of the BMA’s GP committee said: ‘If ambulance services are deliberately downgrading calls to GP surgeries, or when GPs are with patients on home visits, this leaves GPs unable to respond to the many other important clinical situations that they face each day, which could put other seriously unwell people at risk. 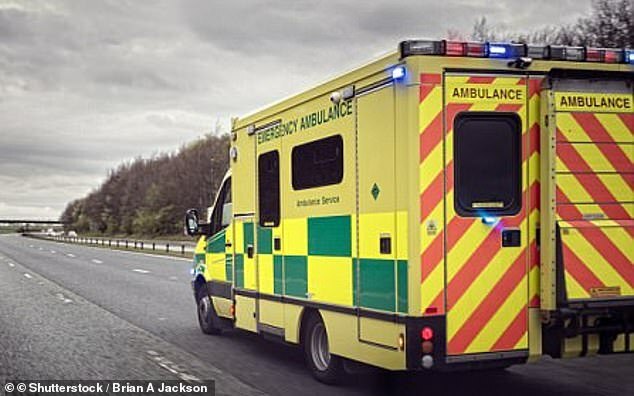 Jonathan Ashworth MP, Labour’s Shadow Health and Social Care Secretary, said: ‘It seems pretty obvious that if your GP thinks you are so ill you need an ambulance then it really must be an emergency. Leaving seriously sick patients to wait like this is an outrage. The investigation obtained average response times for all types of all for ten of the 13 ambulance trusts in the UK for calls made from a GP practice and all other calls. All ten ambulance services recorded longer response times for GP surgeries for the period October 2017 to September 2018. Waits in the North East were one hour 31 minutes if patients were with a doctor or other healthcare professional, falling to 38 minutes for other members of public. The Association of Ambulance Chief Executives says it ‘categorically refutes’ allegations that calls from GP premises ‘are being deliberately downgraded’. An NHS England spokesman said: ‘Anyone in a life-threatening situation is treated as a priority and response times to the most seriously ill and injured patients have never been better, with an extra £36 million funding to help areas deliver even more improvements.